2) You will be taken to the views and confirmations page. You’ll notice that there is a row for each person the call sheet was sent to. The column that is second to right contains the view counts. If there is a red “X”, it means the person has not yet opened the call sheet link. (Note that if someone opens the email / text but does not click on the link, they will be shown as having not viewed the call sheet.) 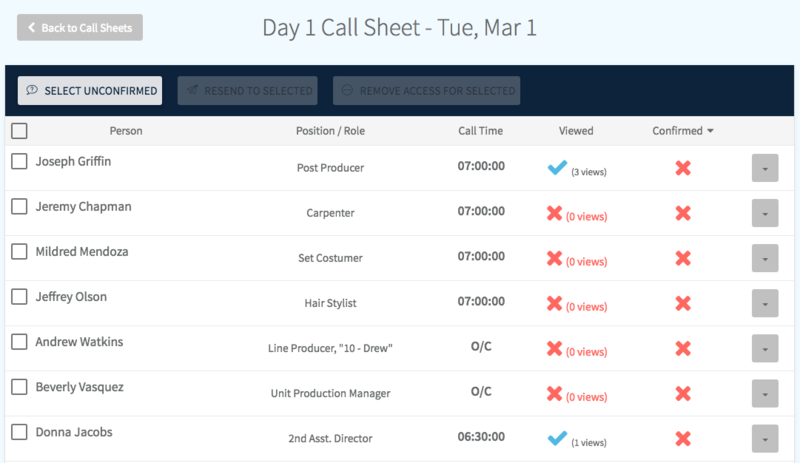 The last column shows who has confirmed their call time by following the call sheet link and clicking “Confirm”. You can sort by either of these columns by clicking on the column header. You can also see how long ago the person viewed / confirmed by hovering over the blue checkmark. 3) To the far right of each row is a dropdown menu. 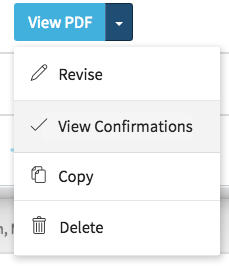 Using the options in this menu, you can resend the email / text to that person (learn more), preview that person’s personalized call sheet page, or remove that person’s access to the call sheet (learn more). 4) At the very beginning of each row is a checkbox. 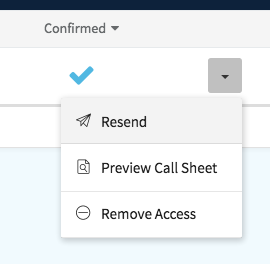 You can check multiple people and then either resend the call sheet emails / texts to them OR remove their access to the call sheet by clicking the buttons in the table header.